Mubychem Group, established in 1976, is the pioneer manufacturer of Potassium Phosphate Tribasic, Pharmaceutical, Fragrance & Flavor chemicals in India. Mubychem Group has several manufacturing facilities spread across Gujarat and Mumbai India and world wide contacts and toll manufacturers. We are exporting globally to countries like USA, Europe, UAE, South Africa, Tanzania, Kenya, Egypt, Nigeria, Uganda, Turkey, Mexico, Brazil, Chile, Argentina, Dubai, Indonesia etc. Tripotassium phosphate TKP is on the FDA's Generally recognized as safe, or GRAS, list of substances as Type of Conclusion:1 It means there is no evidence in the available information that demonstrates, or suggests reasonable grounds to suspect, a hazard to the public when they are used at levels that are now current or might reasonably be expected in the future. TKP is used in food industry, boiler water treatment and other industrial applications. 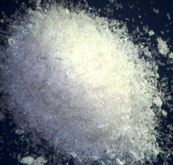 Potassium Phosphate, Tribasic, occurs as white, hygroscopic crystals or granules. It is anhydrous or may contain one molecule of water of hydration. It is freely soluble in water, but is insoluble in alcohol. The pH of a 1:100 aqueous solution is about 11.5. Assay: Not less than 97.0% of K3PO4, calculated on the ignited basis. Loss on Ignition Anhydrous: Not more than 5.0%; Monohydrate: Between 8.0% and 20.0%.